Today I'm wearing Essie Sleek Stick nail appliques in So Haute! (No, I'm not shouting that sentence at you...So Haute! actually has an exclamation point in the name!) (There, that last one...I was shouting.) I've not gone ga-ga over nail strips because I do nail art. And I've always thought polish strips were for people who don't do nail art. But the texture on this design is really spectacular and I was surprised by how much I loved the look. On the first trip out of the house wearing them...I bet I got a half a dozen compliments! You can see full-sized pics in the gallery at the end of the post. Essie describes So Haute! as a gold spiked crimson. The textured finish is comprised of alternating rows of smooth, raised gold and crimson dots. 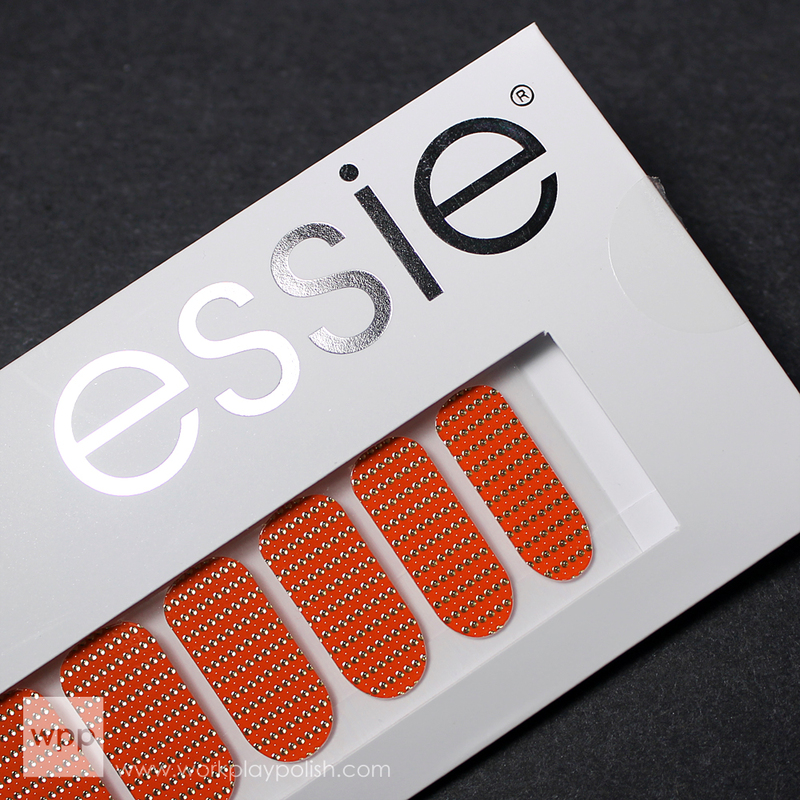 Essie's appliques are pre-cured under UV light; so they're supposed to be longer wearing and more chip resistant than other brands. Essie claims 14 days. I can't vouch for that because I only wore them for two and half days. But they did look almost as good when I took them off as the day I put them on. That may be the result of operator error. More on that below. Application is pretty straight forward. Place them on clean, bare nails and apply pressure over the entire surface. I started by centering the "sticker" right at my cuticle. Then I sort of pulled and pressed as I worked my way over the nail. I have very narrow nail beds that are really curved (from side-to-side). So while I could get the applique to fit at the cuticle, I did have space on some nails at the grooves. In the pic above, you can see it on my thumb. (TIP: After I took the pics, I used a small nail art brush and a dab of Essie Snap Happy to fill in. It worked like a charm.) I also somehow got the strip on my middle finger almost over my cuticle. There, it started to lift a bit after the second day. So be sure to push your cuticles back and stay clear of your skin. There are 12 designs in the Sleek Stick Collection and I think they're all very classy chic- not a cheezeball in the bunch. They retail for $10.25 and can be purchased everywhere Essie is sold (Target, Walgreens, CVS, etc.) You can see all of the designs at the Essie website. What do you think? Anyone tried these and wore them for a full 14 days?